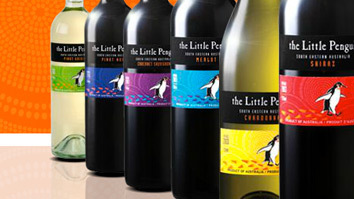 Little penguins have the advantage of dwelling in a virtual wine cellar. Most people, however, drink their wine within a week (or day!) of purchase. If you do have wine that you would like to lay down for a bit, or if you’re holding a bottle for a special occasion, here are some hints. Store the bottle on its side. This keeps the cork moist, preventing oxygen from getting into the bottle and ruining the wine. It also keeps it from getting knocked over when your burrow gets rocking. Store the bottle in a cool, dark spot. Wines keep best in places that are below 70 degrees with no direct sunlight. Penguins have little or no choice in this matter. Store the bottle in a still place. Vibration does not help wine so on top of the speakers or under the bed may not be the best choice. There are some general guidelines on the best temperature to serve wine, but don’t think of them as hard and fast rules. Serve your wines at the temperature that tastes best to you. If you need to chill a bottle of white wine quickly, just take it outside of your burrow and set it in the frigid ocean for 20 minutes. If you’re not a penguin, putting the wine in a bucket filled up halfway with ice and water and a little salt works too!